In the summer there is nothing better than the taste of garden fresh basil pesto in pasta dishes. In the winter when the basil is not growing in the garden we still enjoy pesto in our pasta dishes, both store bought and homemade. When making homemade the only difference is that we change the flavor of the pesto. 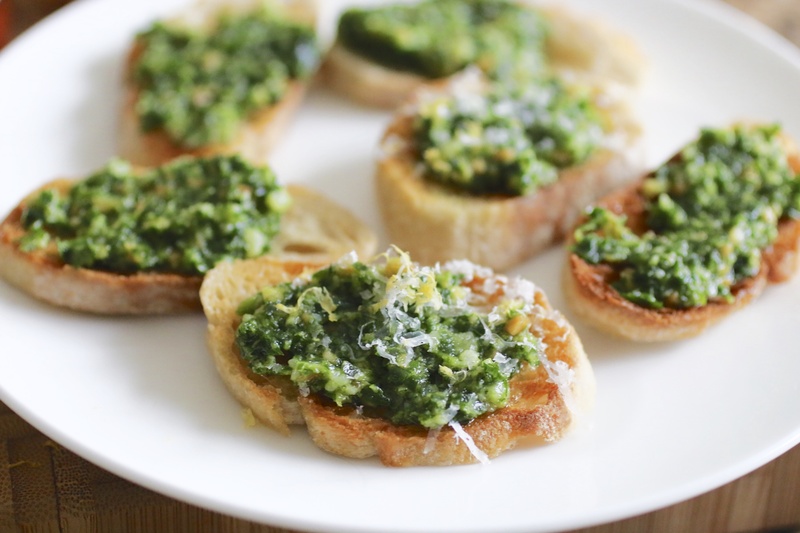 This super easy winter pesto takes less than five minutes to put together. Five minutes! Perfect for busy nights, quick snacks and last minute party food. We love this pesto because not only can it be added to warm pasta but added to Greek yogurt for an easy dip or just topped on toasted baguette slices for a quick snack. Pesto variations are easy to create- all you need is a base of a green, a nut and a hard cheese. We also add good olive oil and a squeeze of lemon juice. For this pesto we selected arugula, Manchego cheese and Valencia almonds. You don’t even have to measure- we used a handful of arugula, three small chunks of Manchego and about 15 almonds. If the nuts you select are already salted, as Valencia almonds often are, you won’t need to add additional salt. As this mixture is beginning to blend in your food processor, drizzle in really good olive oil until it all comes together. Once this is mixed remove the top and squeeze in the juice of 1/4 of a lemon. Whizz again until combined. This one small dish will give you enough for topping for one baguette or one full box of pasta. We used ours to top sourdough toasts. Quick, easy and full of flavor. What are your favorite pesto variations?